This screen grab shows WXtrackGL at work. I used the scroll bars to locate myself just to the north of the equator. You can see the earth, with a relief map superimposed, and the tracks of a number of satellites. The orbit of my primary satellite is shown as a red circle. You can substitute your own surface image on the earth, making WXtrackGL capable of viewing a variety of information in a 3D format. You can download WXtrackGL and use it free of charge. Whether you want to work in real-time, or step ahead a month at a time is up to you. Keep a constant viewpoint above your home location or anywhere on the earth, or fly along with the satellite. 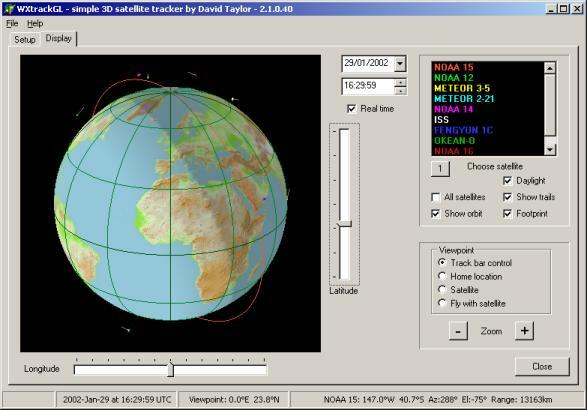 The program's status bar maintains a continual display of time, viewpoint, and satellite position. 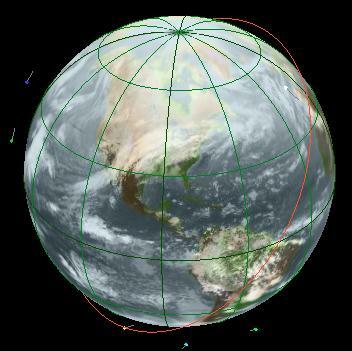 Another use for WXtrackGL is as a viewer of world information presented in a rectangular projection. For example, here is combined thermal information from the world's geostationary satellites (produced by GeoSatSignal) showing white cloud areas superimposed on a shaded background map. The composite rectangular image can be displayed in 3D and rotated to view as you wish. In this case, the viewpoint has been set above Florida.